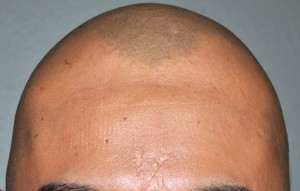 The sagittal crest deformity with an otherwise normal skull contour around it can be reduced by bone burring through a small horizontal incision at its back end. 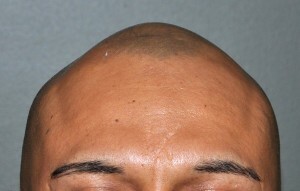 The sagittal crest deformity that is more severe can make the top of the head appear very peaked with a v-shape due to a parasagittal contour deficiency. 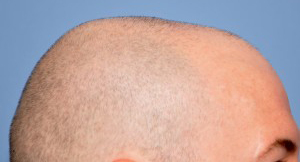 Bone reduction of the sagittal crest in these cases may not be sufficient to create a smooth and more natural convex shape to the top of the head. 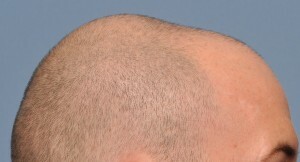 Augmentation of the parasagittal areas up to the level of the sagittal crest may be done to establish a more normal shape. 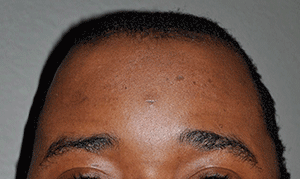 One option for correction of the more severe sagittal crest deformity is the placement of parasagittal bone cement through a more open scalp incision, paralleling the sagittal crest. Some reduction of the sagittal crest can be done concurrently for a dual sagittal reduction and parasagittal augmentation effect. 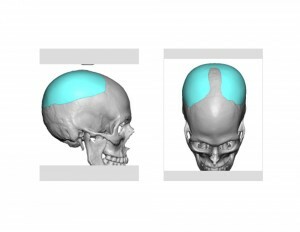 Another treatment option is the fabrication of a custom skull implant that covers the entire top of the head. It is made so that it is very thin in the midline (only thick enough to act as a connector to the sides of the implant) and has greater thickness in the parasagittal areas. Its design creates a smooth and more natural contour to the top of the head from the front and back views. Smaller versions of the same parasagittal skull implant concept can also be two separate small implants made and placed along the midline sagittal crest. For small parasagittal deficiencies, separate custom made silicone implants can be used for augmentation. They do not need to cross the sagittal midline and can be designed so that they go beyond the temporal line and sit on top of the temporal muscle/fascia to provide an augmentation effect more laterally. Closure of the neonatal posterior fontanelle (soft spot) can be associated with an excessive accumulation of bone. This is created by the fusion of the sagittal and lambdoidal sutures which for unknown reasons can create too much bone growth at this intersection. This can result in a prominent bump or posterior fontanelle knob. 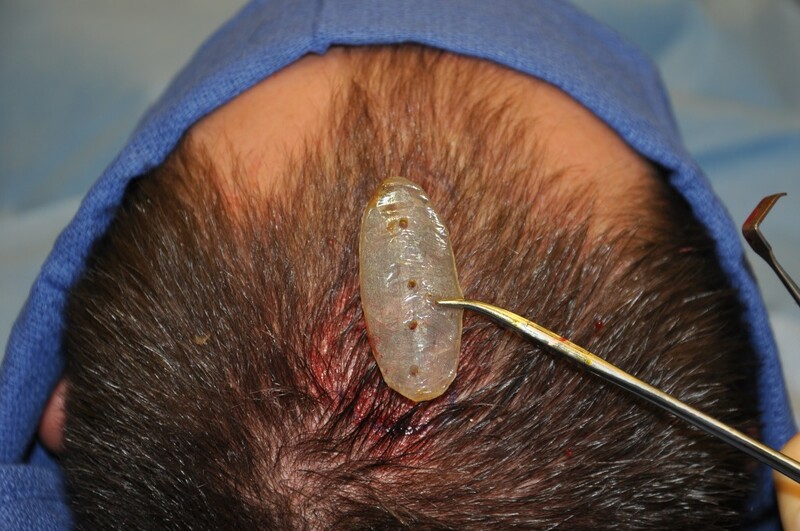 It can be reduced by simple bone burring through a small scalp incision directly over it. Conversely and more commonly, closure of the posterior fontanelle can be incomplete with a much thinner bone thickness than the surrounding skull bone. This creates an indentation or dimple as a residual remnant at the original posterior fontanelle site. The sagittal dimple can be corrected through the addition of a small amount of bone cement to raise its contour to an even level with that of the surrounding skull. Unlike the raised sagittal crest deformity, the sagittal dip deformity is a midline depression that can develop between the original anterior and posterior fontanelle locations. This creates a relative linear midline depression or ‘dip’ in the contour of the top of the skull. This is most easily filled in with small hand carved silicone or Gore-tex implant that matches the length and width of the sagittal dip. Flatness or irregularities across the top of the head create an unnatural shape to the normal frontal and profile convexity of the skull. 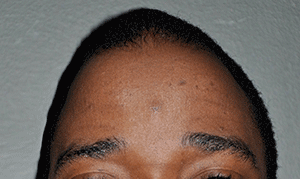 Complete augmentation of the top of the head can be done by a custom silicone skull implant. 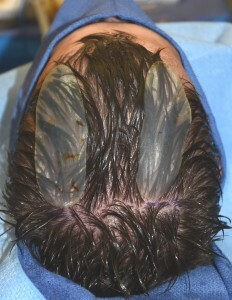 The implant does not have to be very thick to create an overall smoothness but it must cover the entire top of the head. 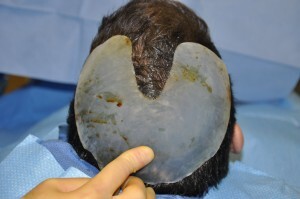 This skull cap implant due to its thinness can be placed through a much smaller scalp incision than the size of the implant would suggest.